My husband and I went to a wine tasting the other night. As someone more at home with a bottle of beer, I always feel terribly grown up when I go to a wine tasting (which, by the way, I do quite rarely, despite having gone to one in Helsinki last week). This time, we were invited by someone I barely knew, so I really feared the worst. In fact, we almost didn’t go at all. Part of our reluctance stemmed from what happened the last time we went to a wine tasting with people we didn’t know. It was about eight years ago, right after we’d moved into a new neighborhood. I’d joined a local women’s group, thinking it would be a fast way to make friends. And so, when I saw that someone in the group was hosting a wine tasting, I thought: Why not? My husband likes wine and maybe we’ll meet some like-minded souls. If you’ve never been to a wine-tasting, it works like this: You’re given a bunch of different wines to sample “blind,” and then, at some point in the evening, the names/origins/grapes etc are revealed. There may even be a contest. But at this particular gathering eight years ago, it didn’t work that way. Instead, just as it seemed like the “moment of truth” had arrived, the hostess – now thoroughly sloshed herself – stood up and announced that we’d all be playing a little game called “Guess the Price.” She then began brandishing the different bottles of wine and instructed people to shout out their guesses as to how LITTLE the wine had cost (e.g., $9.99, $7.99, four bucks from Trader Giotto’s, etc.). But another reason we almost took a pass this weekend was that we didn’t know anyone else who was going, and so we thought: Why bother? As you get older, there’s a tendency to hunker down and say, hey, we’ve got enough friends as it is…we know our “type”…why take a chance on someone new? Let’s just go see a movie and call it a night. And guess what? We had a great time. It was a beautiful flat, there was plenty of interesting conversation and they served great wine. Plus, this handsome Italian guy named Marco was pouring all evening. What’s not to like? A new website on AOL called Politics Daily launched today. Looks like a great line up of writers! 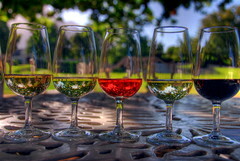 Image: Wine Glasses by Slack12 via Flickr under a Creative Commons License.